Oceanside is North County Coastal's northern most community and 3rd largest city in San Diego County famous for the Oceanside Harbor, palm lined Harbor Beach, and Oceanside Pier. Included below are homes for sale in Oceanside. If you would like more information on any of these Oceanside real estate listings, just click the "Request More Information" button when viewing the details of that property. We can provide you with disclosures, past sales history, dates and prices of homes recently sold nearby, and more. And, if you haven't already, be sure to register for a free account so that you can receive email alerts whenever new Oceanside houses come on the market. Oceanside is 6 miles along the northern most strip of north county San Diego. Oceanside is the third largest city in San Diego County. The Marine Corps Base Camp Pendleton is located just north of Oceanside. The Oceanside Pier is the longest wooden pier on the western US Coastline. Ruby’s Diner is located at the end and most days you will see people fishing off the pier. Seaside in Oceanside is also known as the downtown district of the city. It is currently undergoing a major redevelopment program with new residential buildings, restaurants, and beach resorts. Seaside is considered the area bounded by Coast Highway, Seagaze Drive, and Oceanside Boulevard. It is one of the city’s oldest neighborhoods with many homes built in the 1920s. Homes have craftsman, Spanish, French eclectic, and Tudor architectural influences. Some homes are designated with plaques by the Oceanside Historical Society. 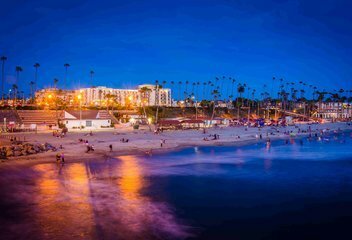 Restaurants, shopping, and attractions in Seaside include the Oceanside pier, Wyndham Beach Resort, 333 Pacific, the Oceanside Surf Museum, and Oceanside Museum of Art. Local events include weekly sunset and farmers markets, Surfing America USA Championships, and the Independence Day Parade. Students living in Seaside attend schools within the Oceanside Unified School District including Kelly Elementary, Lincoln Middle School, and Oceanside High School. Arrowwood is an upscale master planned community located in northeast Oceanside and next to the main Camp Pendleton Entrance. It has some of the largest and most expensive homes in Oceanside. Arrowood is made up of single family homes in old and new neighborhoods including SeaCountry, Saybrook, TollBrothers at Arrowood, and The Greens that began development in the 1950s and 1960s. Newer neighborhoods began construction in the 2000s. The community has an exclusive junior olympic size swimming pool, clubhouse, and barbecue areas. The community is known for being an anchor of the Arrowood Golf Course, an 18 hole 6721 yard championship course designed by Ted Robinson, Jr.. Parks in Arrowood include Hilltop Park, which has an activity center, pool, 10 acre open space for sports and activities, playground, picnic area, and barbecues. Other parks include Melba Bishop Park and Recreation Center and Libby Lake Park. Students living in Arrowhead attend schools in the Oceanside Unified School District including Libby Elementary, Roosevelt Middle School, and El Camino High School. The Greens at Arrowood is an intimate enclave of single family luxury residences developed by Toll Brothers surrounding the championship eighteen hole public Arrowood Golf Course developed by Toll Brothers. Amenities within the community include a junior Olympic-sized swimming pool, picnic barbecue area and beautiful, natural recreational spaces to explore. When searching Fire Mountain homes for sale Oceanside you will find Fire Mountain is a desirable area of Oceanside and is located in southeast Oceanside. Originally, Fire Mountain was inhabited by the Luiseno tribe and was once a main agricultural center with citrus and avocado groves and family farms. It was formally annexed into the city of Oceanside in the 1960s and was known as north Carlsbad prior to that. Woodlands Estates is a northeast community in Oceanside situated near Jeffries Ranch. Homes are large, upscale estate homes with oversized lots. Most of the homes were built in the mid 1990s and has no association fees. The community has horse trails for residents. Woodland Estates is within close proximity to all of Oceanside and is situated close to the 76 freeway. Residents have nearby shopping, restaurants, and parks. Nearby parks include the Guajome Regional Park. Students living in Woodland Estates attend schools in the Oceanside and Vista school districts. Schools include Mission Meadows Elementary, Roosevelt Middle School, and Vista High School. Wilmont Ranch is a community in northeast Oceanside and is next to the Arrowood community and Camp Pendleton main entrance. It was first built in 2000 and is composed of a mix of modest and large estate homes. Homes are built on large lots with big front and back yards. Homes have craftsman, bungalow, and modern style architectural influences. Nearby parks in include Hilltop Park, which has an activity center, pool, 10 acre open space for sports and activities, playground, picnic area, and barbecues. Other parks include Melba Bishop Park and Recreation Center and Libby Lake Park. Wilmont Ranch is also within close proximity to the Arrowood Golf Course, restaurants, and shopping. Because it is close to the 76 freeway, residents have easy access to beaches, and nearby Carlsbad and downtown Oceanside. Students living in Wilmont Ranch attend schools in the Oceanside school district. Schools include Del Rio Elementary, Libby Elementary, Cesar Chavez Middle School, and Mission Vista High School. Thunderbird Estate Homes are the best new home value in Coastal North County. There are seven semi custom homes on large lots with two floor plans. The Staten is 2,308 square feet with four bedrooms. The DePalma is 2,418 square feet with a study. Both floor plans have air conditioning and first floor master suites. Morrow Hills Oceanside is located east of the Arrowood Country Club, north of the San Luis Rey River, and just west of Bonsall. Marisol at Ocean Ranch is a new community by Meritage Homes in Oceanside near the Old Mission San Luis Rey off the 76 freeway and Melrose Avenue. The homes are built on large lots and have large front and back yards. All the street names have horse themes such as Spanish Horse, Saddlebred, Lipizzaner, and Chincoteague. There are a total of 5 cul de sacs and 93 homes in this small community. All homes have noteworthy exteriors, spacious kitchens, and beautiful master suites. Homes have energy efficient appliances, Smart System irrigation, concrete tile roofs, granite countertops, carpet, and ceramic tile. Homes are of Spanish colonial, craftsman bungalow, and California ranch architectural influences. Some homes have views of the San Luis Rey River. Students living in this community attend schools in the Oceanside and Vista school districts, such as Mission Meadows Elementary, Roosevelt Middle School, and Vista High School.